Featuring a quick closure and simple release Boa lacing system that's adjustable for a personalised fit. Next generation safety boots with all of the legendary Blundstone comfort and safety features that you know you can rely on. 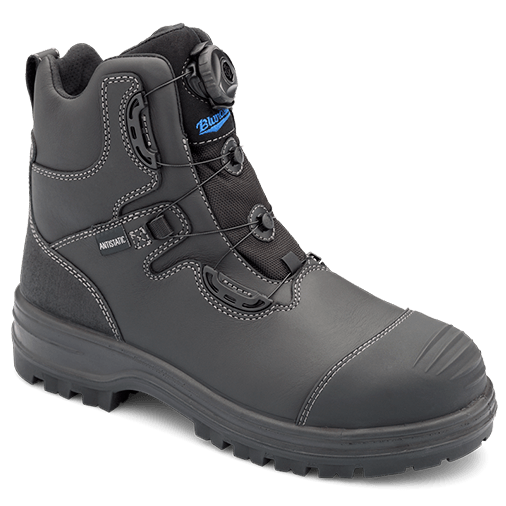 Black leather ANTI-STATIC safety boot — 150mm height. Quick closure and simple release Boa® lacing system that is adjustable for a personalised fit. Polyurethane (PU) midsole. Thermoplastic Polyurethane (TPU) outsole highly resistant to abrasion, hydrolysis and microbial attack. SPS Max - XRD® Technology in the heel and forepart strike zones for increased impact protection. Toe and heel reinforcement for extended wear protection. Luxury PU footbed with arch support and the revolutionary XRD® Technology to provide extra cushioning and absorption/redirection of impact with every step taken. Also anti-bacterial, breathable and washable. Fitted shank for maximum torsional stability. Broad fitting 200-joule impact resistant Type 1 steel toe cap.